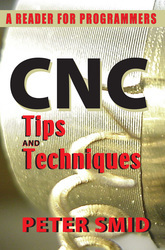 During the past decade, Peter Smid wrote dozens of column for Shop Talkmagazine that addressed the full gamut of CNC topics, such as tapping and threading and knurling; program length and memory needs; G-codes, M-functions, cycles, macros … and more still. Offers more than 60 focused columns which have been thoroughly reviewed since its initial publication and updated as needed to reflect ongoing changes in the field. Columns are presented here in chronological order of when they first appeared. Includes an alternative table of contents, organized by topic. Provides several useful appendices and an extensive index. Appeals to both veterans and newcomers with tips and techniques that can be applied at work and speed up the learning curve.